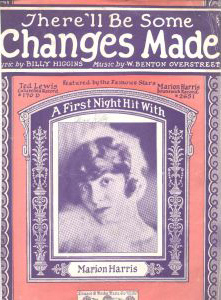 “There’ll Be Some Changes Made” was written in 1921, with music by Benton Overstreet and lyrics by Billy Higgins, two African-American vaudeville performers. Ethel Waters had a hit recording of this song in late 1921; other early recordings include those by Marion Harris, Josie Miles, Fats Waller, and the Chicago Rhythm Kings. Later recordings include those by Billy Holiday, Peggy Lee and Tony Bennett. Even western singers have been drawn to the song by artists including Chet Atkins, Bob Wills and His Texas Playboys and Pee Wee Russell’s Rhythmakers. “There’ll Be Some Changes Made” was recorded in 1975 and was released on Tony Bennett Sings Life Is Beautiful. It was arranged by Torrie Zito.